I read in NY Teacher that our contract places parents and "educators back in the driver's seat in our city's public schools." I find the claim humorous. I doubt UFT Unity asked many parents what they wanted and I know they certainly didn't ask me. The lack of democracy in my Union is for me, perhaps, the single most depressing aspect of this whole educational war over "reform." The people who are supposed to be protecting me forge ahead, caring little to listen to my concerns or those of the rank and file. When UFT Unity says "Solidarity," what exactly do they mean? 1. Does solidarity mean signing a loyalty oath to uphold Unity policies come hell, high water, your conscience or the differing views of your constituency? If that's solidarity, I am sorry for democracy. 2. Does solidarity mean voting for a contract for which you have never seen the M.o.A. (the 300-member Contract Committee and the Executive Board) or for which the M.o.A. was only released on the eve of the vote (Delegate Assembly), allowing little time for any delegate or his or her constituency to digest it? If solidarity means having so little faith in your own ability to analyze things or so much faith in Unity's ability to spoon feed grown adults, I cannot stomach that flavor of solidarity. 3. Does solidarity mean looking the other way when the contract enshrines principles like selling out your workforce with a second-tier, due-process ATR status, test-based accountability, merit pay and more PD at the expense of time with the children? If that's solidarity, I'll leave it! 4. Does solidarity mean forging a pre-election system that gives retirees, many of whom are far removed from the current onslaught against public education, even more voting power in leadership elections (when most unions don't even allow their retirees to vote)? Indeed, Unity won the majority of its votes from retirees--who must have golden memories of a very different Unity than the one I know. Does solidarity mean removing the vote for District Representatives from the rank and file? If solidarity means muting the voice of the current membership, you can keep your solidarity. 5. Does solidarity mean sending out Unity propaganda as you brand ed bloggers (except your own) as myth makers, but won't even engage in debate to point out those myths? If solidarity means censorship, I say to hell with it. 6. If solidarity means sending reps to every school to sell the contract instead of canvassing the rank and file prior to negotiations to see what it wants and listening to its concerns (as in Chicago), then I say I've already had too much of your trickle-down solidarity. 7. If solidarity means having delegates spread fears that the contract is the best we can do and they can become #151 on some line if they do not like it, then I say the word "solidarity" is an insult. 8. 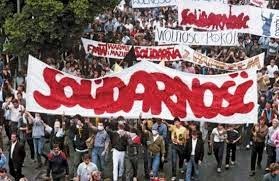 If solidarity means buying the loyalty of your own delegates through double pensions, whopping salaries for after-school office work and perks, including nice vacations to AFT conferences at which Unity reps must close their minds to a spectrum of views as they raise their hands at the appointed time, then I say God help us all. 9. If solidarity means never having to say you're sorry for things like mayoral control under Bloomberg and 22 domains of Danielson, then I am sorry for your brand of solidarity. 10. If solidarity means selling out our brother unionists by setting a pattern and supporting politicians who would lie to us and then destroy our union, then solidarity spells suicide! 1. Delegates must encourage the rank and file to educate itself on current national threats to education. 2. The needs and concerns of the rank and file must be valued by the UFT. 3. The rank and file of the UFT must help set the terms of the current educational debate. 4. The rank and file must be encouraged to build its bonds with parents, community members, concerned activists and unionists to identify and support common causes. Indeed, we all must help set the terms of the current debate, not the businessmen who send their kids to elite, private academies and not an elite cadre of union leaders well-removed from the realities of NYC teachers. 5. Membership must be empowered to act. If Unity really cared what we thought, it wouldn't build a buffer of retiree votes around itself to muffle the voice of its active membership. It wouldn't put its faith in loyalty-oath swearing, reflex-hand raising caucus members who don't seem to care that Unity doesn't value their independent thought enough to allow them adequate time to even digest the M.o.A. I will not accept solidarity on terms that stifle my voice. When only 17% of current membership cares to vote in leadership elections, and leadership seems unfazed so long as it is reelected, there is no "solidarity," only sickness.